Luis was born and brought up in Stockport but both his parents are Spanish. This had a huge influence on his upbringing and he was fluent in Spanish from an early age. Luis met his wife, Louise, at college when they were just 17 and they were engaged at 21 but got married 14 years later in Vegas. He trained as a Graphic Designer and likes play the Ukulele, make model aeroplanes and keep bees. His wife bought him his first beehive as a birthday present and his passion for it escalated – he now keeps eight hives; four at home, three at his allotment, and one at his caravan. His love for Manchester City football club is demonstrated by his sky blue bee-keeping gear, even adding on the gold winner’s badge when they won the title. Smiley and affable but extremely focused, anything Luis sets his mind to he accomplishes. An extremely inventive baker, Luis creates thoroughly researched and unique bakes such as his Tequila Slammer Cheesecake or his cherry brandy pipette gateaux. 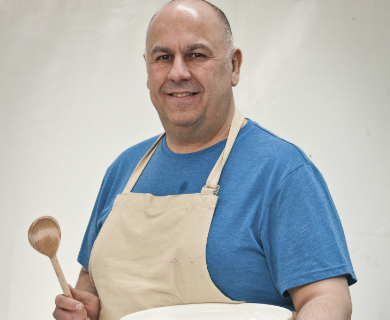 He uses honey from his bees and fresh ingredients from his allotment in his baking. He preserves his own jam and his Bakewell tarts are his favourite bake to make (and eat).